[SOLVED] What do the app &quot;usage&quot; times in battery settings represent, exactly? [SOLVED] What do the app "usage" times in battery settings represent, exactly? I'm trying to figure out a way to track app usage on my phone without downloading an app that is going to share my personal data. At the bottom of Battery settings, there is a list called "App usage since full charge" which lists about a half dozen apps, each with a % to the right (I guess % battery used), and a "used for X minutes" line underneath. What does the X refer to exactly? Is that the time I'm actively using the app, or the amount of time when the app was using system resources (which I assume could include running in the background). Why don't the percentages on the battery chart add up to anywhere near 100%? [SOLVED] What is trying to connect to the network? [SOLVED] What do CPU Total, CPU Foreground, and Keep awake mean? 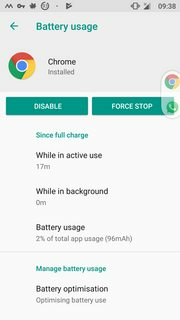 [SOLVED] Why is the com.android.browser process draining my battery? [SOLVED] Is there anything that can show exactly what has awaken my phone?